Well, happy 2014 everyone!! I am thankful for another year and hopefully lots of accomplishments this year but not without hard work. Right? Thank you all for making 2013 a memorable one. I am sure you are all fully recovered from the parties and ready to get back in the swing of things. 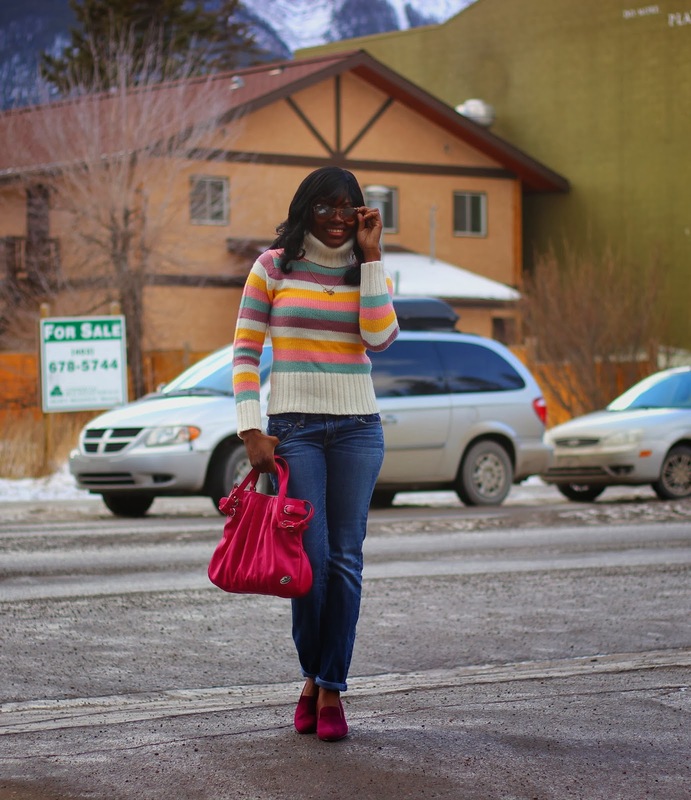 Well, i am starting off the year with a colorful post in a pretty colorful outfit. Who loves food like i do? How often do you Google a place to eat hoping the reviews are not a bit too exaggerated and the food is really good? Or how many times have you ended up in a hotel in the middle of nowhere, a town or new place and you just want to grab a quick bite somewhere without suffering the pain of bad food and terrible service dilemma? Everyone? Well, consider me your new found food buddy or friend who will hopefully save you from a culinary heart break. No, i am not a foodie nor a chef but having worked in hospitality for years i have developed great love for food. Years ago while living in Maryland, USA before i ever thought of blogging, i would set out on my days off to discover new restaurants. To me it was fun and satisfying. Then i would find a reason to bring my friends and family there after an endless praise about these places. Guess what? They thanked me after. Knowing how my travels have landed me in so many unknown places, i still do it. Now i have decided this year to include a post every now and then about my food crawling adventure with details of how it inspires every chosen outfit. After stumbling into this humble little cafe place one faithful day with William, i knew i had to come back for more. Being new here in town, finding a good place to eat can be a bit challenging so sometimes you take a risk and if you are lucky, good for you. If you are not, just don't go back. That simple. This place called Harvest was a home run. Nice little coffee shop that serves breakfast and lunch is located in the heart of downtown Canmore, Alberta, a 30-40 minutes drive form Kananaskis Village. I love a "hole in the wall" type restaurants because in honest truth, they often serve the best food out there. 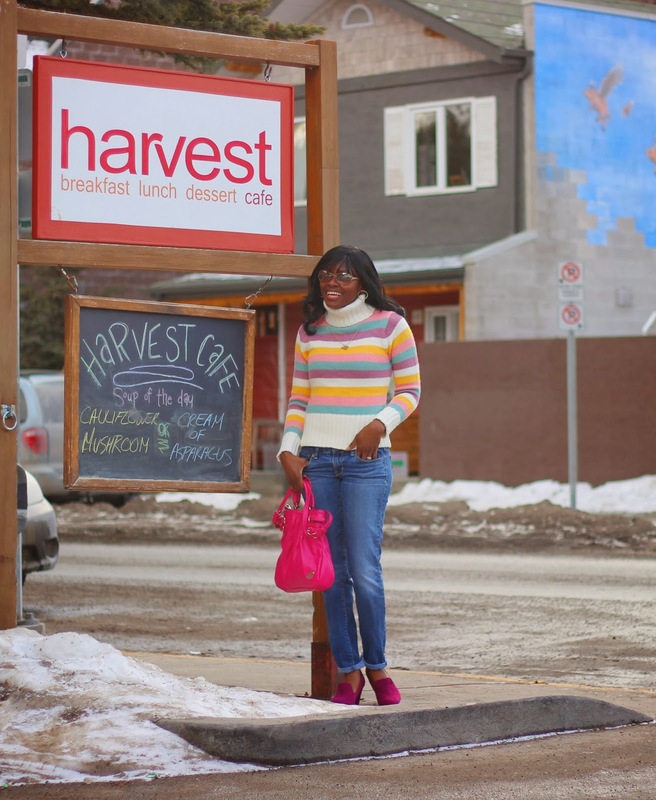 Now this place called Harvest is one and i loved it as soon as we walked it. Small with wooden furnishings, clean and well lit with not much of a decor. How it works? You walk up to the counter to order off the black board menu, pay, grab your drinks right there and then and go seat yourself at a table. One of the ladies or even the cashier brings your food to the table for you within a short few minutes after ordering. What did we order? Same thing we did the last (first) time we were there: Chicken & Brie Wrap. Oh my gosh!! Food came out hot, chicken was fresh and juicy. Adding pear to the wrap was genius. The melted brie cheese in it was an excellent idea and the cranberry mayo- There is nothing like it. It all came together and explodes in your mouth like a fountain of culinary heaven- DELICIOUS!! While William had some homemade quinoa salad for his side, i opted for some homemade mushroom soup. Price Point? For my fresh, homemade chicken wrap with a decent size cup of soup, good service even with the lunch rush was $10.79 . Drinks are additional prices. Why is this place so good? Besides the fact that we went back for more of their tasty cooking, some other folks did too because minutes after we got our food, they were sold out on a few items on their menu and our chicken wrap was one. Phew! Close. My advice? Try to be there before the lunch rush, especially on a Sunday afternoon when we were there. Not staying? Sure, everything can be ordered to take out with you. 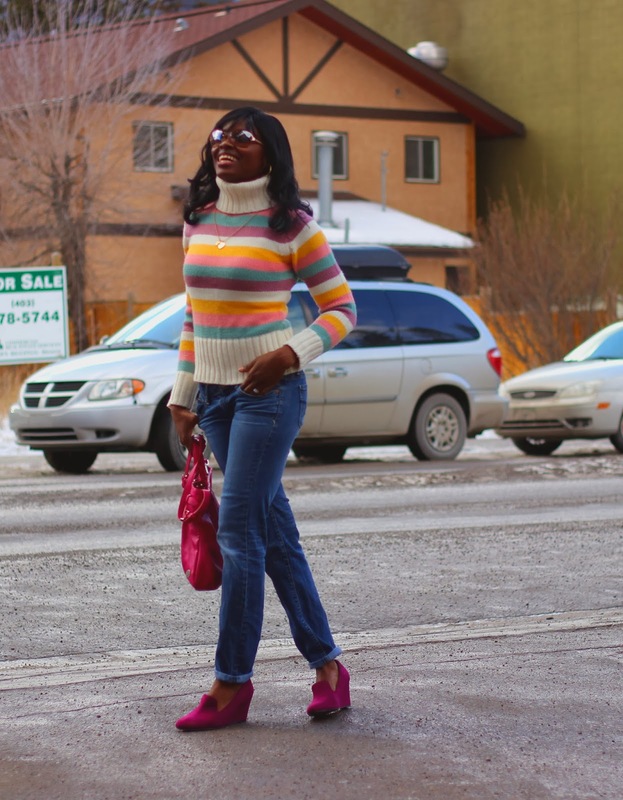 Now to my outfit: For lunch on a winter day at a downtown cafe, i paired a candy striped sweater with a pair of denim pants and suede wedges. The denim helped tone down all the colors moderately. One thing i have learned from the past is, a downtown cafe attracts a lot of mixed crowd but predominantly younger to middle aged crowd. Although, Harvest Cafe doesn't seem to, but some cafes have bands come in to play or organize fun events for their guests. Personally, i think a cafe atmosphere is always a great place for meeting people and making friends but you want to make sure you are dressed for the part anyway. Great way to start beautiful images and you look awesome. Happy New Year my friend lets continue this journey. Your sweater is really, really cute - I love the colours! Happy New Year! May it bring you happiness, good health and success. what a nice place!! I love your striped sweater!!! I am a big foodie and love to try out new and intresting places for food..
i love the colours of your sweater. This is most definitely the best way to start the new year- in a bright outfit. I love rainbow stripes, can't get enough of them. This totally reminded me to wear my rainbow stripe cardigan sometime soon...maybe even to work tomorrow! This sweater is adorable and you're so lovely!!!! Haapy New Year! You look lovely! What about the cold and storm over there? I watch it on tv OMG!!! Amazing casual grab lunch look! I love when I can find a good meal in a lovely and aesthetically decorated cozy place. Wish you all the happiness, love, joy and success in 2014 Busola! Cute post Busola! Love your outfit, especially the multi-colored sweater. You look fab! Happy New Year to you! Wishing you the same Lubka and more. Thanks for a memorable 2013. Thank you so much :) Happy New Year to you too. Chicken and brie. Stop. Anything and brie is a good idea to me. Lol.